Every time we go to one of the patisseries near our house for lunch I always have one of their caramelised onion tarts. 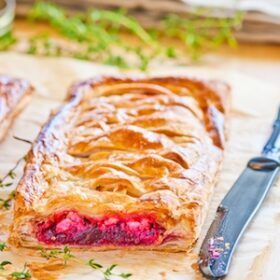 I just adore caramelised onions and the combination of the creamy tart filling with the sweet onions is heavenly. So when the other day I had a craving for a caramelised onion tart I decided to make my own. While I opted to make my own shortcrust pastry you can certainly use store bought. 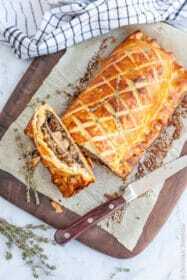 Careme make fantastic frozen pastry that are wonderful to keep on hand in your freezer. However, if you’ve never made your own shortcrust pastry, and always thought it was too difficult, you would be surprised by how simple it really is. All it involves is blitzing a few ingredients together in a food processor for a few minutes and refrigerating before rolling out. Really, it’s that easy. I opted for a wholemeal pastry base, which adds a lovely crumbly nuttiness to the base which I think adds to the overall rustic quality of the tart much more than a white flour version. For the filling the star of the show is onions, slowly caramelised to make the most of their beautiful sweetness. And while 3 onions might seem a lot for the filling of the tart you will find that the onions will sweat down dramatically during the cooking process, so don’t be alarmed. For the cheese component of the filling I suggest a strongly flavoured cheddar – Collier’s make an amazing vegetarian Welsh Cheddar which I adore – or try goats cheese. Serve the Caramelised Onion Tart warm or at room temperature with a simple lettuce salad, or any salad of your choice. 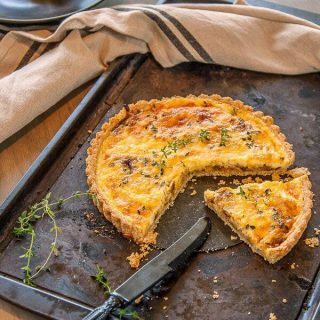 Serve this Caramelised Onion Tart warm or at room temperature with a simple lettuce salad, or any salad of your choice. Begin by making the pastry. Place the flour and butter in a food processor and process until the mixture resembles bread crumbs. Add the egg yolk and water and pulse until the mixture begins to come together to form a ball. Turn the mixture out onto plastic wrap and shape into a disc. Refrigerate for 30 minutes. Remove the pastry from the refrigerator and roll out the pastry on a lightly floured bench or silicone baking mat until approximately 5mm thick. Line a 30cm loose bottomed tart tin with the pastry, making sure to press into the sides, and trim the excess. Refrigerate for 15 minutes. Preheat the oven to 180 celsius (355 Fahrenheit) and line the tart with baking paper and fill with baking weights or beans. Bake for 10 minutes before removing the baking paper and weights and baking for a further 5 to 7 minutes or until the base is dry and lightly golden. Set aside to cool. To make the caramelised onions, heat a large frying pan over a medium low heat and add the butter before adding the onions and reduce the heat to low. Cook for 10 minutes before adding the balsamic, 2 tsp of the thyme leaves and brown sugar. Cook for a further 10 minutes until caramelised. Set aside to cool. In a bowl add the eggs and egg yolk along with the cream and milk and whisk to combine. Season to taste. Place the onions in the base of the tart and spread evenly over the base. Sprinkle with the grated cheese before topping with the egg mixture. Finally, sprinkle with the remaining thyme leaves. Bake for 15 to 18 minutes or until the filling is just set. For a professional finish on the tart base, run the rolling pin over the top of the tart tin to remove the excess. Feel free to replace the cheddar with the cheese of your choice. Hi, I made this and it is amazing, just wondered if you can freeze it? I haven’t tried freezing this one, but I have frozen similar tarts without a problem. I would freeze it BEFORE cooking, and then add some additional time when cooking it from a frozen state. Hi Nicole, Yesterday I tried your caramelised onion tart recipe and it was a big hit. I came across your page while googling how to make Onion Tart and was so pleased that it turned out just the way you portrayed it. I’m so glad you enjoyed the recipe. Thanks so much for coming back to tell me – it always makes my day! Yum! I love the way everything’s been put together in your food photographs! Onions tarts remind me so much of travelling through the South of France! Definitely bookmarking this now! What a splendid tart for dinner! The whole grain crust and cheese are a seductive pairing with caramelized onions, a scrumptious post! This looks amazing! My dad loves onions, I’ll have to make this for him! 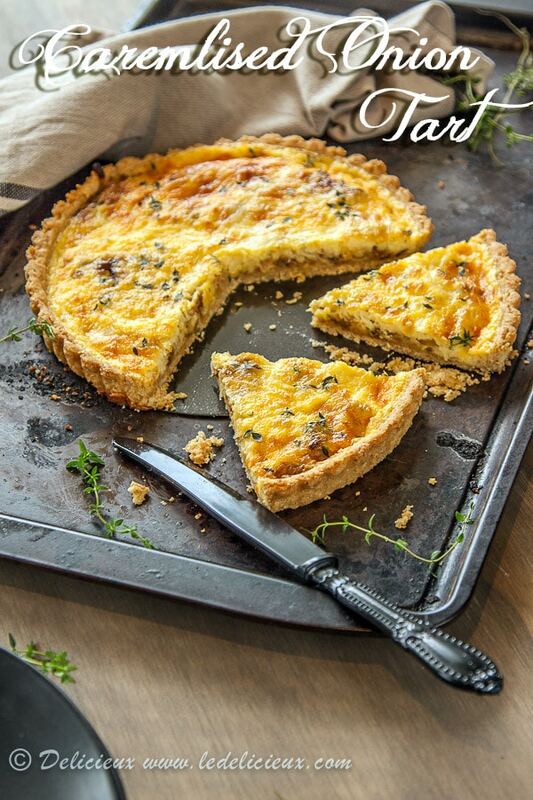 What a beautiful and flavorful tart! Oh well, now I am hungry, and it’s 3 AM (woken up by a storm). This looks like something I could not have just slice of. Absolutely fantastic. I love caramelised onion tarts and feta is my choice every time. The sharp saltiness of the feta contrasts nicely with the sweet onions. Your photos almost made me start drooling! This looks absolutely delicious. My oh my that tart looks amazing. I’ve recently become fond of savoury tarts and I would love to dig right into this! Caramelized onions are a fave. If i could i would put those on all of my tarts, pizzas, salads and everything. The tart and the pictures are gorgeous! 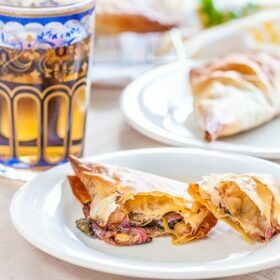 I never had caramelized onion tart but i definitely like the idea and the recipe sounds pretty much doable! 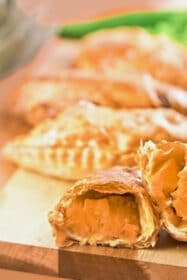 Oh my Jennifer… look at that flaky crust! I could go for a slice of that beautiful tart right now. I’m afraid I’m completely weak in the face of caramelised onions and there’s every chance I’d eat them before they made it into the tart. Lovely recipe, thanks. You couldn’t have posted a dish I like any more than this one. I could top caramelised onions with more caramelised onions I like them that much. I always keep Careme in the freezer too. Sadly I can’t afford to use it for everything but when I want the pastry to be perfect and I don’t have a lot of time, that’s what I use. I don’t think it can be beat for puff pastry. I adore caramelized onions too – what a perfect, thick and delicious looking tart! Caramelized onion in any baking dish is a favorite…this one is going to be one another soon…lovely clicks, Jennifer! One thing that I don’t mind is to caramelize onion, no matter how long it takes! Yum, I love your tart filled with the caramelized onion!! What gorgeous pictures, Jen!!!! 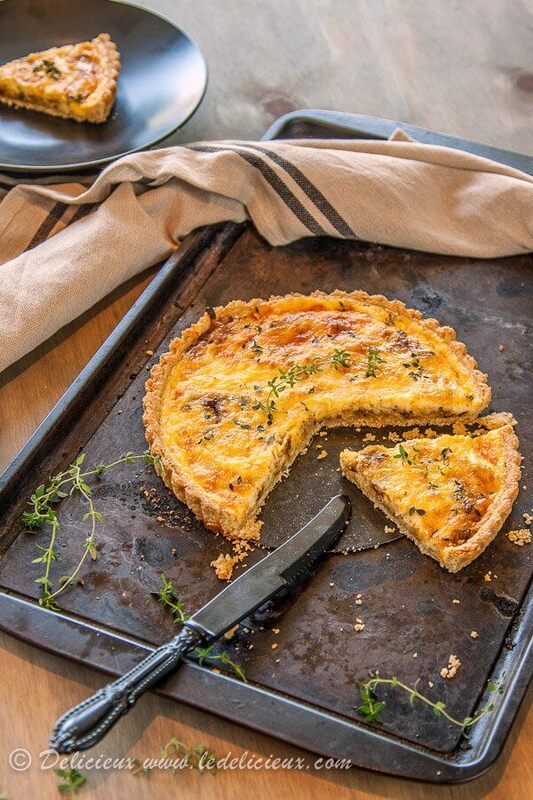 Caramelized onions are my weakness – I adore this tart & the fresh thyme is perfect here!